At what age are you supposed to be nonchalant about Halloween? At 26 it seems like I should be over it, perhaps carving a pumpkin or maybe wearing a plum lipstick on the 31st or loading up the woeful selection of horror films on Netflix. But I can’t shake my love of Halloween. It looks bright and colourful, it’s a holiday of creativity and fun, it smells of burning pumpkin flesh from tealights and cheap make up and marshmallows. 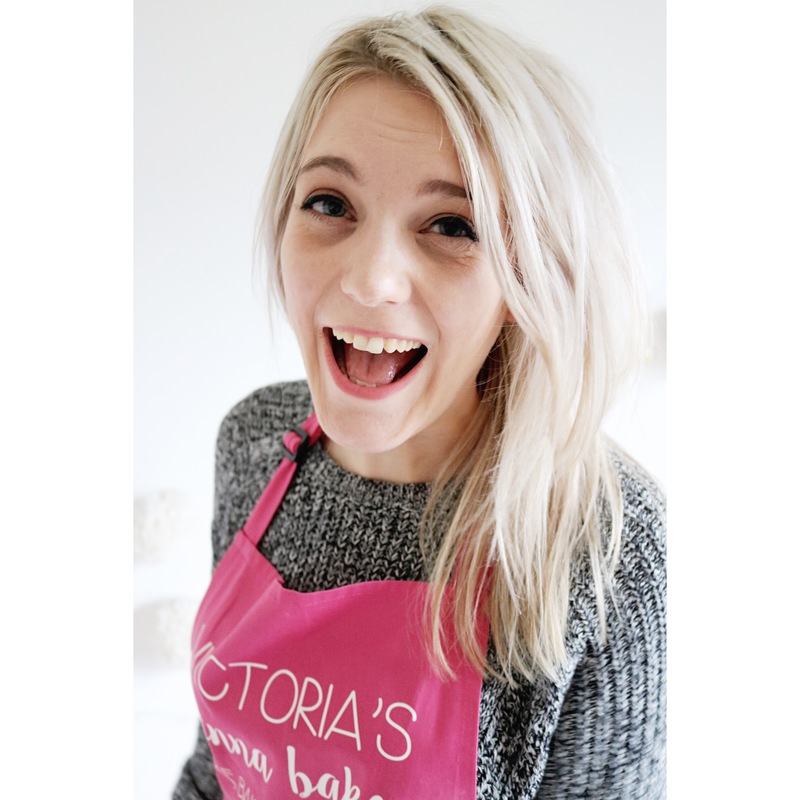 I want to eat gingerbread men iced like skeletons, decorate my flat with fake cobwebs despite a fear of spiders and tell awful jokes about ice scream. I love this time of year. As the leave fall and turn to mush, the air chills and November approaches, its a last hurrah to the prettiest part of autumn before the nights are blacker than black, the car needs deiced and the central heating is on constantly. So at 26, I still need a little childish cheerfulness. So I made cupcakes. If you know me, you’d think eyes would terrify me, having undergone a pretty gruesome surgery a couple of years ago that was so painful to recover from, it could almost certainly make for a decent horror movie itself. But when you have to care for your eyes perhaps a little more than some other people do, you learn to appreciate the intricacies of them. How a contact lens works, the way it bends and squashes corneas to correct vision and make life less blurry. The way drops relieve tear ducts from dryness and how to rest when they’re bloodshot and tired. But you also know that most people find them incredibly squeamish, especially if they’ve ever watched that scene in La Chein Andalou. Don’t Youtube it, it’s pretty gross even by my standards. 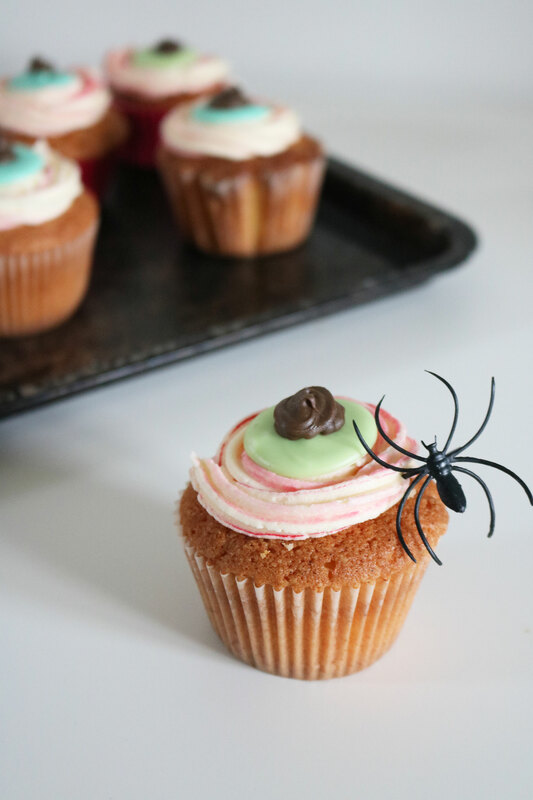 So as I wandered the aisles of a supermarket early on Saturday morning, I realised I didn’t want to make a cute cupcake with pumpkins or ghosts and instead make something fun and gross that evokes everything I love about Halloween. 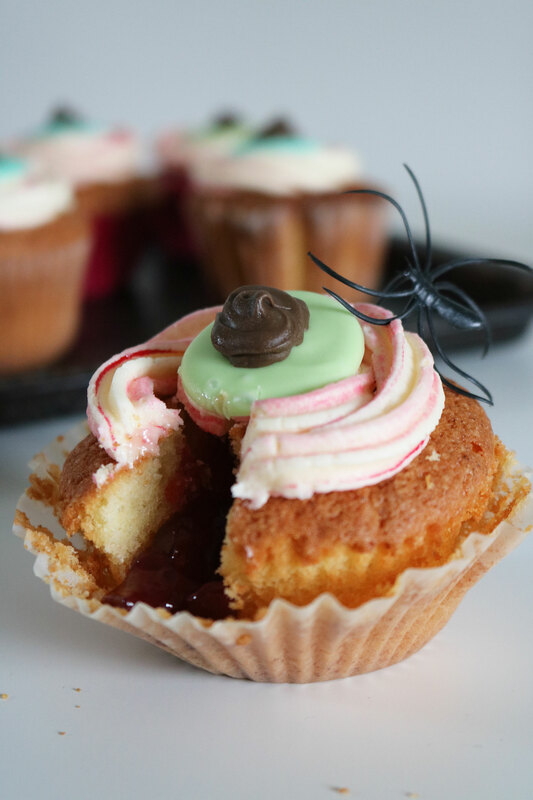 As simple as a cupcake can be, all that is required to turn a cute cupcake into a gruesome one is raspberry coulis and some coloured chocolate pupils. I love how easy it is to create a bloodshot eye by painting a piping bag with food colouring, and it’s simply delightful to bite into one, bursting the eyeball with a trickle of raspberry blood. Happy Halloween everyone! 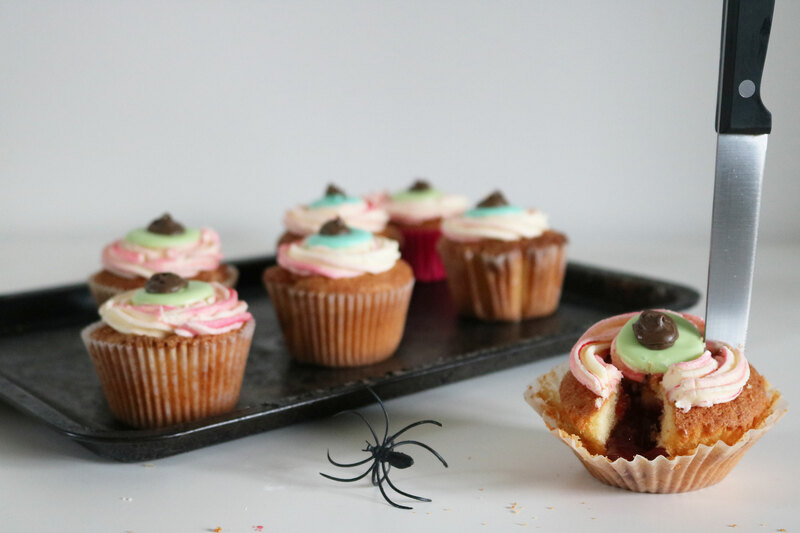 Looking for another spooky bake this Halloween? Why not try these Vanilla Marshmallow Ghosts? To make the chocolate pupils, melt the white chocolate in a heatproof bowl over a pan of simmering water, taking care not to let the bowl touch the water. Once it has almost melted, take the bowl off the heat and keep stirring until the chocolate is completely smooth. Divide between two small bowls and wait a few moments for the chocolate to cool slightly, otherwise it will seize when the colouring is added. Slowly add a few drops of blue and green gel food colouring to each bowl, stirring to combine until you get your desired colour. Place a piece of baking parchment on a tray and spoon chocolate circles around 1 inch in diameter onto the paper, smoothing into round shapes using the back of a teaspoon. Repeat until all the chocolate is used up then set in the fridge for 20 minutes. Melt the milk or dark chocolate in the same way then pour into a piping bag and snip off the end. Pipe a small circle into the middle of each eye for pupils then return to the fridge to set. For the cupcakes, preheat the oven to 190oc/170oc fan and line a 12 hole muffin tin with cupcake cases. In the bowl of a stand mixer, beat the butter and sugar together until pale and creamy for around 3 to 5 minutes. Scrape down the sides with a spatula and with the mixer running, add the eggs one at a time, scraping in between each one to ensure the batter is evenly mixed. Add the flour and baking powder and beat until well mixed then add the vanilla and the milk until the batter easily drops off a spoon. Divide between the cupcake cases and bake for 15 to 20 minutes until golden and a skewer inserted into the middle comes out clean. Remove from the oven and leave to cool in the tin for 5 minutes before lifting each cake out and onto a wire rack to cool completely. To make the buttercream, beat the butter in a stand mixer or large bowl with a handheld mixer for 4 to 5 minutes until very pale and creamy. Sift in half the icing sugar and slowly start the mixer to combine the butter and sugar before increasing the speed and beating for 2-3 minutes until pale and fluffy. Add the remaining icing sugar and vanilla paste and continue beating until well mixed and fluffy. To make the icing creamier, add 1 to 2 tbsp of milk and beat again. 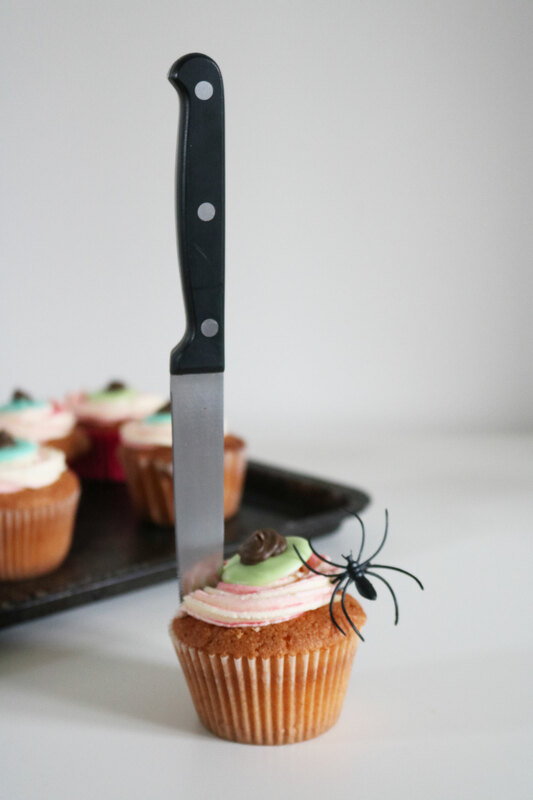 To assemble, use an apple corer or a small knife to cut a small hole in the top of each cupcake, reserving the tops and taking care not to cut too deep or the jam will leak out the bottom. Spoon in the raspberry coulis or thinned jam into the middle until it reaches the top and replace the cake to act as a lid. With a clean paintbrush, paint the inside of a piping bag with red gel food colouring and add a star shaped nozzle to the bag. Spoon in the buttercream and snip off the end of the bag so that the nozzle can be pushed out around halfway. Starting in the middle of each cupcake, pipe a swirl of buttercream moving towards the outer edges of the cake in a rose shape. Repeat with the rest of the cupcakes and press the chocolate pupils in the middle of the icing. Store the cupcakes in an airtight container for up to 3 days. Haha thanks! I think those witches fingers biscuits look pretty creepy actually so well done! Thanks Emma, they’re real tasty! 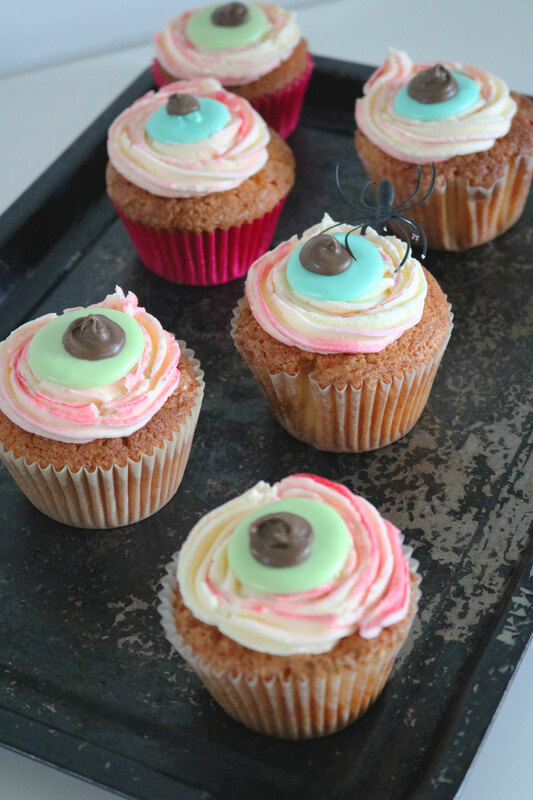 You could still make them without the creepy pupils and they’d still be great now Halloween has passed!